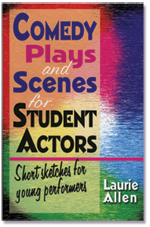 Teachers and directors just can’t get enough of Laurie Allen’s sketches for teens, ideal for classroom practice or contest use. This new collection of plays and scenes for teens offers more real-life situations for student actors to perform, portraying characters like themselves and their friends. These 26 fresh, original skits range from three to seven minutes with cast sizes from two to seven. Titles from this comic collection include: “Seriously Overdue,” “Use Only as Directed,” “Zebra Hamsters,” and “Save Me from Myself.” All scenes and short plays are believable and easy for shy or gregarious, beginning or advanced actors to perform. These scenes are perfect for classroom practice or for an evening of entertainment.